Ants became dominant after adaptive radiation at the beginning of the Cainozoic. By the Oligocene and Miocene ants had come to represent 20-40% of all insects found in major fossil deposits. Of the species that lived in the Eocene epoch, approximately one in ten genera survive to the present. 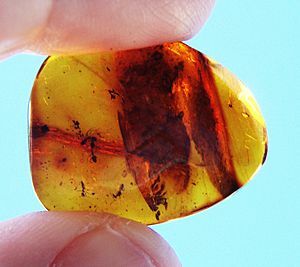 Genera surviving today comprise 56% of the genera in Baltic amber fossils (early Oligocene), and 92% of the genera in Dominican amber fossils (apparently early Miocene). Like other insects, ants have an exoskeleton, an external covering that provides a protective casing around the body and a point of attachment for muscles, in contrast to the internal skeletons of humans and other vertebrates. Insects do not have lungs; oxygen and other gases, such as carbon dioxide, pass through their exoskeleton via tiny valves called spiracles. Insects also lack closed blood vessels; instead, they have a long, thin, perforated tube along the top of the body (called the "dorsal aorta") that functions like a heart, and pumps haemolymph toward the head, thus driving the circulation of the internal fluids. 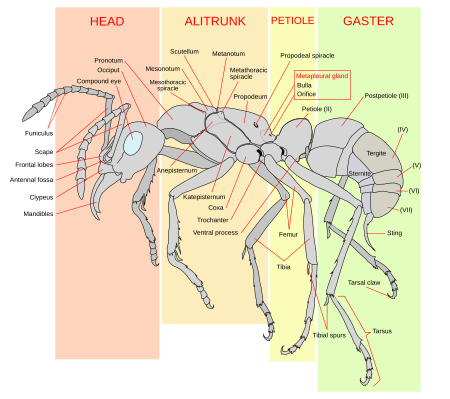 An ant's head contains many sensory organs. Like most insects, ants have compound eyes made from numerous tiny lenses attached together. Ant eyes are good for acute movement detection, but do not offer a high resolution image. They also have three small ocelli (simple eyes) on the top of the head that detect light levels and polarization. 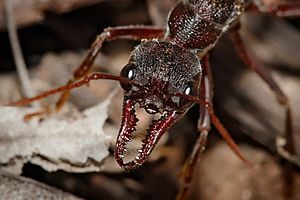 Compared to vertebrates, most ants have poor-to-mediocre eyesight and a few subterranean species are completely blind. However, some ants, such as Australia's bulldog ant, have excellent vision and are capable of discriminating the distance and size of objects moving nearly a metre away. Ants communicate with each other using pheromones, sounds, and touch. 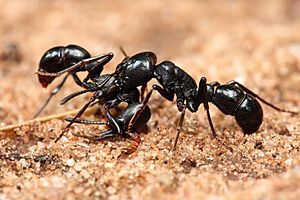 The use of pheromones as chemical signals is more developed in ants, such as the red harvester ant, than in other hymenopteran groups. 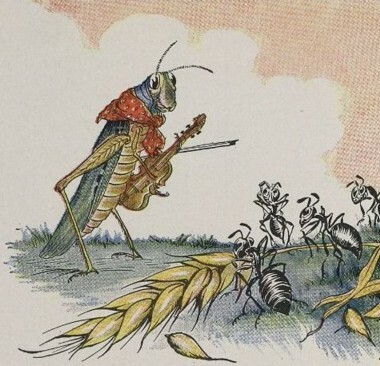 Like other insects, ants perceive smells with their long, thin, and mobile antennae. The paired antennae provide information about the direction and intensity of scents. 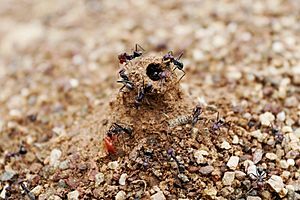 Since most ants live on the ground, they use the soil surface to leave pheromone trails that may be followed by other ants. 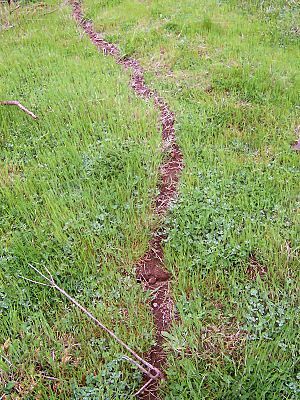 In species that forage in groups, a forager that finds food marks a trail on the way back to the colony; this trail is followed by other ants, these ants then reinforce the trail when they head back with food to the colony. When the food source is exhausted, no new trails are marked by returning ants and the scent slowly dissipates. 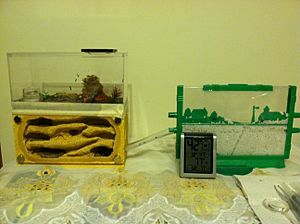 This behaviour helps ants deal with changes in their environment. For instance, when an established path to a food source is blocked by an obstacle, the foragers leave the path to explore new routes. If an ant is successful, it leaves a new trail marking the shortest route on its return. Successful trails are followed by more ants, reinforcing better routes and gradually identifying the best path. Ants use pheromones for more than just making trails. 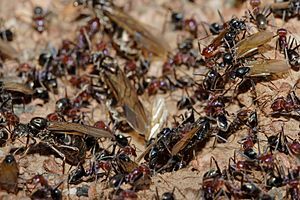 A crushed ant emits an alarm pheromone that sends nearby ants into an attack frenzy and attracts more ants from farther away. Several ant species even use "propaganda pheromones" to confuse enemy ants and make them fight among themselves. Trap-jaw ants of the genus Odontomachus are equipped with mandibles called trap-jaws, which snap shut faster than any other predatory appendages within the animal kingdom. One study of Odontomachus bauri recorded peak speeds of between 126 and 230 km/h (78 and 143 mph), with the jaws closing within 130 microseconds on average. The ants were also observed to use their jaws as a catapult to eject intruders or fling themselves backward to escape a threat. Before striking, the ant opens its mandibles extremely widely and locks them in this position by an internal mechanism. In addition to defence against predators, ants need to protect their colonies from pathogens. 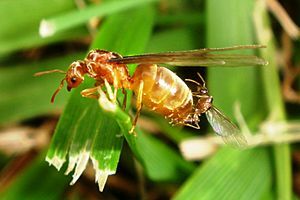 Some worker ants maintain the hygiene of the colony and their activities include undertaking or necrophory, the disposal of dead nest-mates. Foraging ants travel distances of up to 200 metres (700 ft) from their nest and scent trails allow them to find their way back even in the dark. 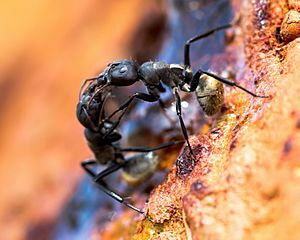 In hot and arid regions, day-foraging ants face death by desiccation, so the ability to find the shortest route back to the nest reduces that risk. Diurnal desert ants of the genus Cataglyphis such as the Sahara desert ant navigate by keeping track of direction as well as distance travelled. Distances travelled are measured using an internal pedometer that keeps count of the steps taken and also by evaluating the movement of objects in their visual field (optical flow). Directions are measured using the position of the sun. They integrate this information to find the shortest route back to their nest. Like all ants, they can also make use of visual landmarks when available as well as olfactory and tactile cues to navigate. Some species of ant are able to use the Earth's magnetic field for navigation. The compound eyes of ants have specialised cells that detect polarised light from the Sun, which is used to determine direction. These polarization detectors are sensitive in the ultraviolet region of the light spectrum. 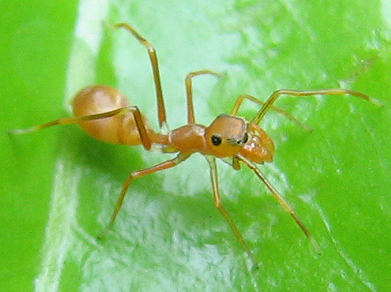 In some army ant species, a group of foragers who become separated from the main column may sometimes turn back on themselves and form a circular ant mill. The workers may then run around continuously until they die of exhaustion. 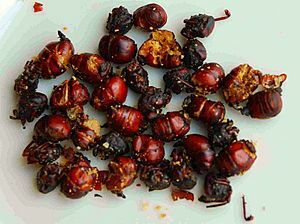 In areas of India, and throughout Burma and Thailand, a paste of the green weaver ant is served as a condiment with curry. 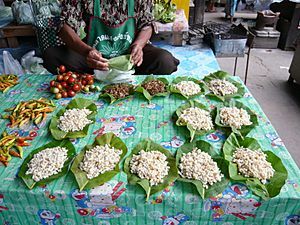 Weaver ant eggs and larvae, as well as the ants, may be used in a Thai salad, yam, in a dish called yam khai mot daeng or red ant egg salad, a dish that comes from the Issan or north-eastern region of Thailand. Ant Facts for Kids. Kiddle Encyclopedia.